With the Country Switcher widget, you can display a drop-down to allows to your customers select their country. You can set a title for the widget and the text for other countries. The Currency Switcher widget is a variation of the Country Switcher widget. 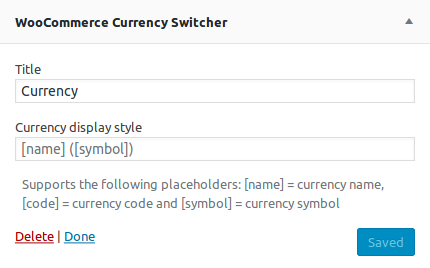 With the Currency Switcher Widget, you can display a drop-down with a list of currencies available in your pricing zones. Internally the Currency Switcher works the same as the Country Switcher when the user changes the currency he also is changing the country.